Enter our #EasterRifficEventAtSLSC Photo Contest on Facebook or Instagram and Win one (1) of three (3) Salt Lake Shopping Center Prize Packages! The most original and creative photos/videos will win Salt Lake Shopping Center Merchandise and Gift Certificates! Attend our “Easter-riffic” Event on Saturday, April 20th from 10 AM – 1 PM. Take photo(s) / video(s) at the Event. 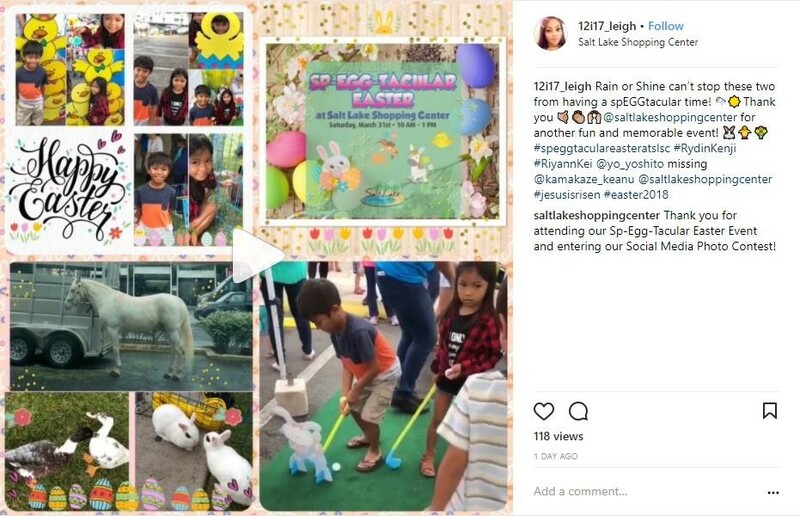 Upload a Photo or Photo Collage or Video to www.facebook.com/saltlakeshoppingcenter or to Instagram with hashtag #EasterRifficEventAtSLSC. Please make sure that your account is set to Public, posts by Private accounts are not viewable for consideration. Limit one (1) entry per person. All Entries Must Be Posted by Monday, April 22nd at 5 PM HST. Winners will be notified by Monday, April 29th. See complete Contest Rules and Restrictions. * Events, dates, and times are subject to change.